Home by Ally: Bringing new life to this old chair. 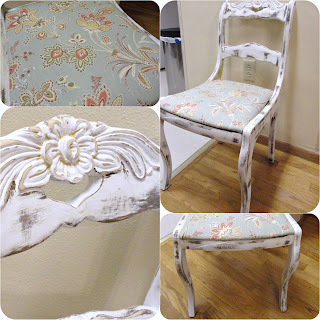 One of my favorite things to bring new life to is chairs! I am a firm believer if you have a corner, you better have a chair to put there ;) For one, it allows more seating but two, you can always switch the paint color to go with anything, bring new life through fabric, etc! I always forget to take "before" pictures because I am too excited to start working on new projects so here she is in all her glory. She was almost falling apart when I bought her but I liked that about the chair, it brought charm through all the cracks, etc. Anyways, hope you are all doing swell and have I mentioned that I can't wait for Christmas! Like I said before, here's a picture of the chair! Let me know what you think and as always, thanks for stopping by!